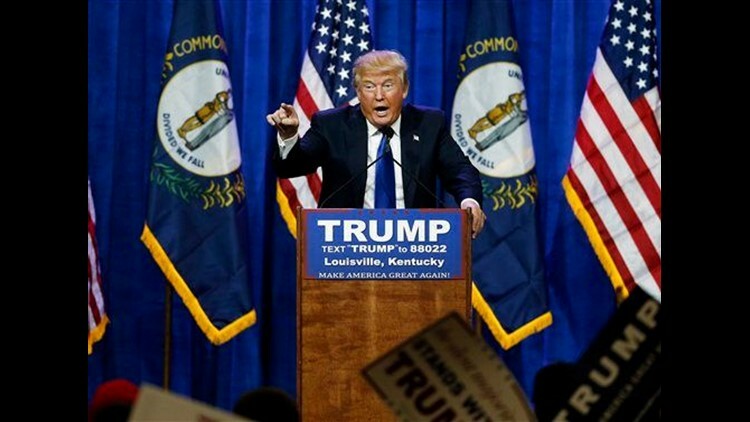 MIAMI (AP) — Donald Trump won primaries in Alabama, Georgia, Tennessee and Massachusetts, claiming the first four Republican victories on Super Tuesday as the New York businessman extends his dominance in the 2016 primary. Ted Cruz and Marco Rubio were fighting to emerge as the leading Trump alternative. Contests in Virginia, Vermont and Oklahoma were too close to call as the first polls closed, while voting continued across four other states. Trump's first four victories came as the GOP front-runner looked for a sweep on a Super Tuesday marked by panic from Republican leaders. Fearing Trump may build an insurmountable delegate lead, top Republican officials lashed out at the billionaire businessman's command of the issues and "seeming ambivalence" over white supremacists as voting began. But having won three consecutive primary elections before Tuesday, Trump tightened his grip on the GOP nomination in primary elections across the country. "These are challenging times for the Republican Party," said Arkansas Gov. Asa Hutchinson, who wanted to stay neutral in the GOP primary but endorsed Rubio last week. Early results of exit polls conducted by Edison Research for The Associated Press and television networks showed large majorities of Republican primary voters in six states said they support Trump's proposal to temporarily ban all non-citizen Muslims from entering the United States. Two-thirds of GOP primary voters in Texas, Virginia and Georgia, 7 in 10 in Tennessee, and nearly 8 in 10 in Alabama as well as voters in Arkansas support that proposal championed by Trump. The results followed a wild prelude to Super Tuesday that featured a dispute over the Klu Klux Klan and extraordinary criticism from several Republican governors and senators who refused to say whether they would support their party's front-runner should Trump win the nomination. A confident Trump brushed off his critics early Tuesday, suggesting that he's growing the party and even attracting Democrats to the GOP. A Trump sweep across the South would be a massive blow for Cruz. The Texas senator long expected the South to be his firewall, but now simply hopes to emerge with a victory in his home state. Rubio's goal on Super Tuesday was more modest — to stay competitive in the delegate count while eyeing a win in his home state of Florida on March 15. Republican officials have rallied behind Rubio over the last week, but he's failed to win a single state so far. With Trump's strong start, the best hope for Rubio, Cruz and Kasich could be a contested national convention in July. Senate Majority Leader Mitch McConnell on Tuesday blasted Trump's "seeming ambivalence about David Duke and the KKK," joining House Speaker Paul Ryan's earlier call for the Republican front-runner to reject racism. The most powerful Republicans in Washington were referring to a weekend interview on CNN in which Trumprefused to denounce the former KKK grand wizard or racist groups. Trump had disavowed them and did so again after facing criticism for wobbling. Tyler Murphy, a 26-year-old Boston resident who works as a project manager for a construction company, said he voted for Trump. For better or for worse, he said, the controversial candidate is the "wake-up call" the country needs. Peoples reported from Washington. Associated Press writers Bob Salsberg and Phillip Marcelo in Boston contributed to this report.